Geoscienstists studying the behavior of earthquakes and volcanic eruptions have traditionally relied on data gathered from events that have already occurred. That changed in 2003 with the start of a program named EarthScope. 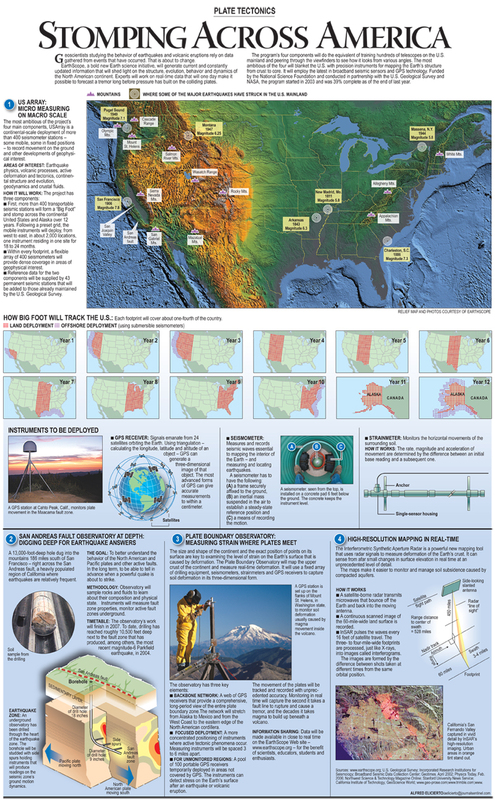 For a detailed look at this full-page graphic, click here to view a PDF. EarthScope, a bold, new Earth science initiative, was designed to generate current and constantly updated information that will shed light on the structure, evolution, behavior and dynamics of the North American continent. Experts will work on real-time data that will one day make it possible to forecast a tremor long before pressure has built on the colliding plates. As envisioned, the program’s four components would do the equivalent of training hundreds of telescopes on the U.S. mainland and peering through the viewfinders to see how it looks from various angles. More than 400 transportable seismic stations wil form a “Big Foot” and stomp across the continental United States and Alaska over 12 years. The instruments will deploy in 2,000 locations, one instrument residing in one site for 18 to 24 months. The most ambitious of the four components will blanket the U.S. with precision instruments for mapping the Earth’s structure from crust to core. It will employ the latest broadband seismic sensors and GPS technology. Funded by the National Science Foundation and conducted in partnership with the U.S. Geological Survey and NASA, the program started in 2003 and, as of the end of 2006, was 39% complete. Story and graphic by Alfred Elicierto, published in the Milwaukee Journal Sentinel on February 27, 2006. I consider something genuinely interesting about your Web site so I bookmarked it.